Utilize Manufacturing Analytics to steer businesses ahead! 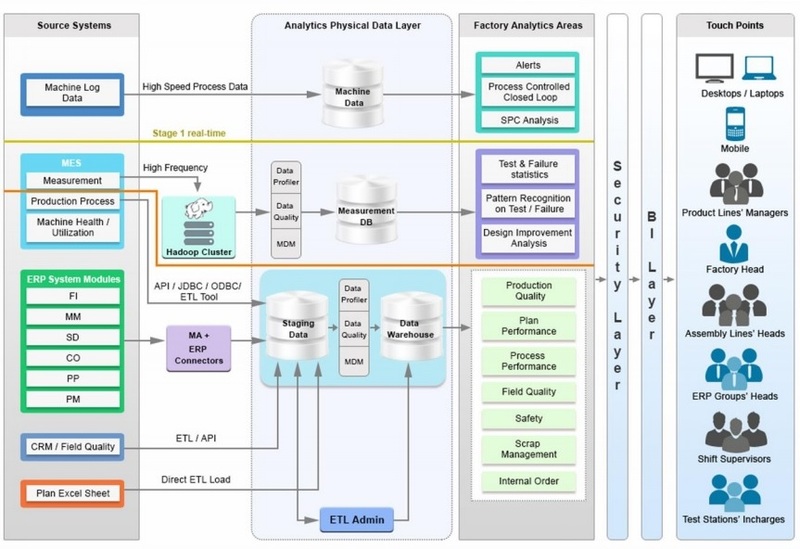 In most of the Manufacturing industries data bank is large, complex, and often fast-moving, and so it becomes difﬁcult to process using traditional database analysis and management tools. The sources of data include CAD models, sensors, instruments, internet transactions, simulations—potentially, records of all the digital sources of information in the enterprise. These set of information are basically large sets of heterogeneous information which require an efficient and dynamic tool/ technology to process the relevant information. GrayMatter’s Manufacturing Analytics, MA+ helps manufacturing business users to analyse machine generated data and helps in making appropriate decisions. With MA+ users can gather and analyse information from supply chain systems, ERPs, sales and marketing and customer relationship management systems, purchasing, shipping and distribution systems, to gain insight into business processes, understand and resolve issues and forecast and predict demand for resources, supplies, inventory and equipment through analysis of historical and current data – this all with the single click of a mouse! Equipped with advanced analytics and predictive models, GrayMatter’s MA+ solution focuses on all key areas of the business applicable to most of the Global Manufacturers. What are the key benefits for YOU AS A MA+ user? Download and Read! By Sandeep| 2018-01-16T12:23:02+00:00	November 16th, 2016|Blogs 2016, Manufacturing Analytics, Uncategorized|Comments Off on Utilize Manufacturing Analytics to steer businesses ahead!